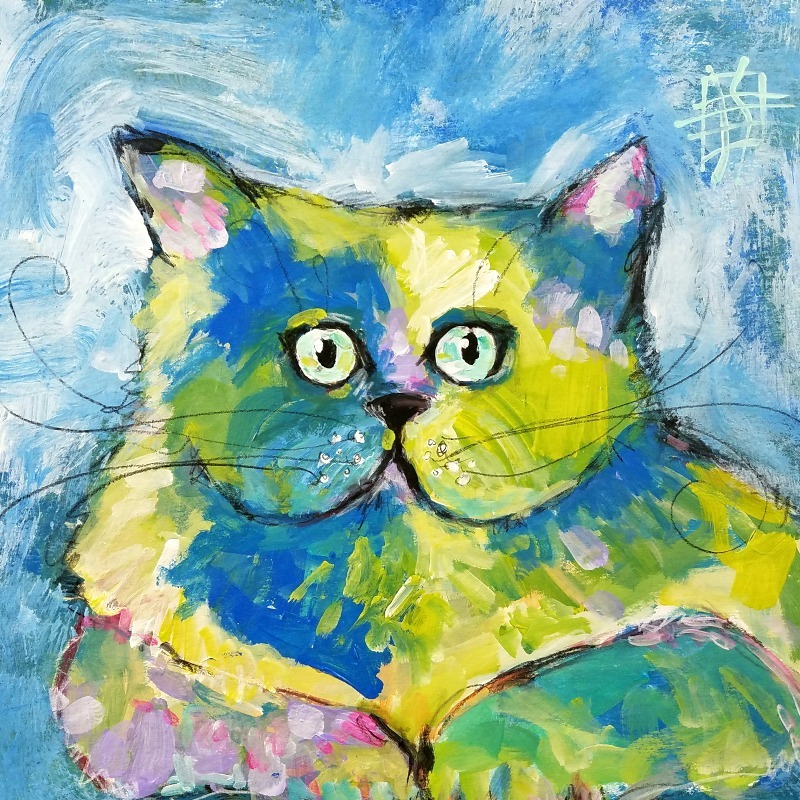 Here's a wide-eyed, and of course colorful, kitty cat for you all! I may or may not be posting over the weekend as we are due a whopper of a storm. We'll see. Meanwhile I went to my orthopedic surgeon today and got a pass....so well recovered from broken wrist that I don't need physical therapy. I told her that the broken wrist recovery (after the first several omg so painful days) was a piece of cake after the thumb joint replacement. That took 9+ months. (And I have one more to go. ugh.) Seriously! Another beauty!! Glad you got a good medical report...enjoy this lovely snow! This is so adorable! So nice to see you back in the groove! Oh my, Joanie, I didn't realize the problem with your thumbs. Glad you are on the up-mend. This cat series is so very purrrfect! Love your colorful kitties, keep them coming! I'm sorry to hear of all your painful end-of-your-arm things....here's hoping the next thumb is a breeze! I am loving your cats! Can't wait to learn to paint some with you! Thx. It feels good to be back...and trying to remember to breathe and not pressure myself. Now thats the trick, eh? You are on the list dear Marty. Hope its soon. Thx for commenting.